Former winemaker of the year, Kim Crawford is considered by many in the trade as King Maverick of New Zealand wine, having conceptualised a virtual winery "over a glass of wine ... because of a couple of babies..." (full story). This wine is a blend of three Marlborough vineyards: Dog Point for grapefruit, citrus and sherbet notes; Brancott for honey and spice, and Wratts Road for weight and depth. This match drew out the chilli (slowly) and then the lemongrass and bay leaf. The garlic bevelled the Thai-derived experience. Brown Bros make some banal stuff, although this wasn't bad, being largely liberated from aspiration. This young grape-juicy, musky wine further softened the avocado and added a citrus twist to the goats cheese. Would also work with lemon polenta. Incidentally John Charles Brown is thought to have pioneered the practice of putting the grape variety on wine labels. This buttery rich, oaky, Rubenesque lady absorbed the soft poached salmon in her pineapple embrace. Chile is the only country that looks like its name, a long (5000km) chilli pepper. This mellow Lyonnaise comfort food traditionally served to perk-up tired guests was pinched into action by the dry sherry. I would consider tipping this not only into the chef, but into the preparation (just after the onions caramalise, replacing brandy and white wine). The yeasty tang of the sherry effectively replaced the croutons. This casserole felt slightly Morroccan - ideal campsite grub. The Belgian raspberry beer found a soul mate in the wine, which had a framboise underlay and a hint of wood smoke. The already supple tannins magically disappeared under the influence of sturdy protein. Don Reca, Francophile and current 'patriarch' of Vina La Rosa is known to entertain guests lavishly, drawing the services of a long-serving butler. Amongst all those bloody bubbles, a gurney of mulberry, blueberry, raspberry and blackcurrant titillate and confuse, acting in harmony with the big summer pudding mass, the glory of the British season. My co-host thought this the best wine for the traditional British breakfast. I think Ridgeview's Pimlico would be better. 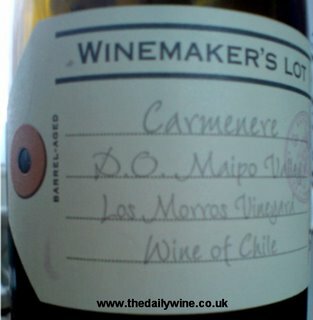 I thoroughly enjoyed a bottle of Concha y Toro's Winemaker's Lot 198 Carmenère '04 [£7.99, Oddbins] - a plush wine for everyday drinking, laced with mocha and a touch of mulberry. Bordeaux rid itself of this turbulent grape variety post-phylloxid, partly because of its propensity to ripen later than its claret-building cousins. Chile are increasingly keen to market itself as its new propagators however, sometimes branded Merlot. Good stuff.